Driving under the influence law, commonly known as DUI law, deals with the criminal charges associated with operating a motor vehicle while under the influence or alcohol or drugs. Driving with a blood alcohol content, or BAC, of .08 or higher is a criminal offense in all 50 states and in Washington D.C. In Washington State, driving under the influence (RCW 46.61.502 and RCW 46.61.5055) for the first offense will probably result in a gross misdemeanor charge. According to the State of Washington Administrative Office of the Courts, a driver with a BAC at .14% or lower may face a minimum of 24 hours in jail and a maximum of 365 days. A person with no prior DUI offenses may face a 90-day license suspension or a fine up to $5,000. A driver with a DUI from the past 7 years can expect additional consequences. Other factors like the driver’s BAC, criminal history, and age can change the charge. When a person is stopped for a potential DUI offense, two separate proceedings begin. The administrative proceeding is conducted through the Department of Licensing and the criminal law process is conducted through the court system. 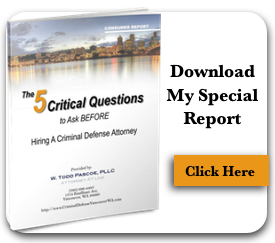 The criminal law process is the part that people have the most concern about. This process begins with the law enforcement officers who tend to follow a similar pattern after making an arrest. Immediately after the arrest the officer will read the Miranda rights which explain the constitutional right the arrested person has. These rights include a right to remain silent and the right to a criminal law attorney. Usually the officer will review the implied consent warnings. Every person who drives in the State of Washington “implies consent” to give breath or blood samples and certain consequences can be attached to the drives refusal of giving that request. The officer will then attempt to obtain evidence that will provide a decision on whether to release the driver or to book him or her directly into jail. Most often, the person will be released to a sober friend or family member, permitted to call a cab or driven home or to a late night diner. After a person has been released he or she will be provided with a notice from the Washington Department of Licensing. This notice will request a hearing to contest any license suspension, temporary driver’s license, or the notice of the first court appearance. Having an experienced criminal defense attorney on your side is vital in ensuring your best interests. Give us a call and let us know about your specific situation to see how we can help you today.